Fellowship of the Royal Society of Arts (FRSA) is an award granted to individuals that the Royal Society of Arts (RSA) judges to have made outstanding achievements to social progress and development. In the official language of the Fellowship Charter, the award recognizes the contributions of exceptional individuals from across the world who have made significant contributions relating to the Arts, Manufacture and Commerce. Fellowship is only awarded to those who can demonstrate that they have made significant contributions to social change, and support the mission of the RSA. Fellows of the RSA are entitled to use the post-nominal letters FRSA. Fellows of the Royal Society of the Arts are entitled to use of the RSA Library and premises in central London. Past and current fellows include leading artists, writers, journalists and former politicians who have made significant contributions to their fields. Previous Fellows have included Stephen Hawking, Charles Dickens, Karl Marx, Benjamin Franklin, and Nelson Mandela. The Royal Society of the Arts is based in The Strand, near the centre of London, England. 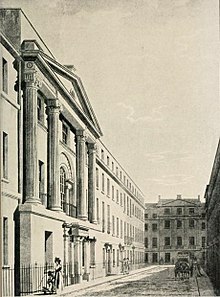 The Royal Society of the Arts was founded in 1754 by William Shipley as the Society for the Encouragement of Arts, Manufacture and Commerce, it was granted a Royal Charter in 1847, and the right to use the term Royal in its name by King Edward VII in 1908. 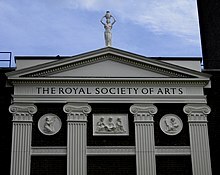 The shorter version, The Royal Society of Arts and the related RSA acronym, are used more frequently than the full name. In addition to the Fellowship, the RSA awards three medals, the Albert Medal, the Benjamin Franklin Medal (following a decision by the Board in 2013, the Benjamin Franklin Medal is now overseen by the RSA US, although the final nomination is ratified by the UK Board) and the Bicentenary Medal. Medal winners include Nelson Mandela, Sir Frank Whittle, and Cambridge Professor Stephen Hawking. Since 1754, the RSA Fellowship has been a community of leaders in the fields of art, literature, journalism, and business who have made significant contributions to society or the arts, and are able to support the mission of the RSA. After the nomination of a candidate has been received, an admissions panel will make the final decision to accept or decline a new fellow. Examples of current fellows, who come from diverse backgrounds and professions, include Tim Berners-Lee, Judi Dench, Alex James, Benson Taylor, and Gareth Malone. Previous Fellows have included Stephen Hawking, Marie Curie, Charles Dickens, Benjamin Franklin and Karl Marx. A partial List of Fellows of the Royal Society of Arts gives more examples. ^ Richardson, Stuart (20 May 2010). "Royal Society of Arts welcomes Blitz studio heads to its ranks". develop-online.net. Develop. Retrieved 11 March 2011. ^ "Heritage". 2011-03-24. Retrieved 2018-03-23. ^ Watt-Smith, Claire (9 November 2009). "Claire Watt-Smith awarded Fellowship of the Royal Society of Arts". BoBelle, London, UK. Archived from the original on 2011-08-12. Retrieved 11 March 2011. ^ University of Hertfordshire. "Hertfordshire Professor elected Fellow of Royal Society of Arts". Retrieved 18 May 2017. ^ Richardson, Stuart (20 May 2010). "Royal Society of Arts welcomes Blitz studio heads to its ranks". Retrieved 11 March 2011. ^ "Post-Nominal Letters". Royal Society of Arts. 2016. Retrieved 9 March 2018. ^ Mabbett, Andy (2013). "For I'm a Jolly Good Fellow (of the RSA)". pigsonthewing.org.uk. Archived from the original on 2016-04-21. ^ Anon (2016). "Nominate a Fellow". thersa.org. ^ Anon (2016). "Information about the Application Process". thersa.org. London: Royal Society of Arts.